...: Where has James been? The first thing you should ask yourself upon a reading of the title of this blog is why the heck am I referring to myself in the 3rd person? Well, I have no clever answer to that question and so continue on unperturbed. Where have I been since December 1st you ask? Well, for a brief and fantastic moment I was in Mexico. Then, I was back in Murrka doing a fairly foreign thing: relaxing. This relaxing continued on for quite a while actually. Only now, in mid to late January, will I be discontinuing that protocol. This extended break was both planned and un-planned I would say. I had quite a long year of training in 2013 (and racing, obviously). I NEEDED a physical and mental break. But I also got sick. Then I was gone for a week for Inside Out. So basically it all adds up to roughly 6 weeks of unstructured training. For the past three weeks I've tried to put a little structure in my life. Running almost every day (but short), riding trails one or two times a week, swimming as it fancied me. I am in somewhat decent out-season shape I would say. 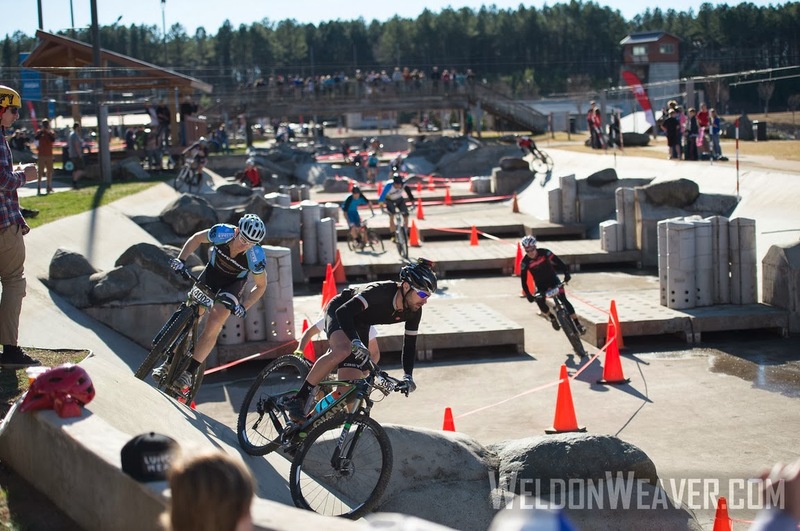 I proved that to myself by winning a 40' short track race out at the US National Whitewater Center last Sunday the 12th. A pictorial article from Pinkbike.com, one of the most well-known mountain biking specific online journalism websites. A brief video and thread on Slowtwitch (that I started, sorry JB!) about the crash of Mr John Behme, which unfortunately took him out for a couple of weeks with a mild left radial fracture near his elbow (or maybe it was his ulna, but who knows I'm just trying to sound smart). Another video with footage taken by a Mr Scott Woodbury showcasing the 40' short track race. All in all, it was a fantastic and unique event put on by the USNWC, who has an ever-growing portfolio of excellent outdoor activities going on at their facilities. If you haven't been out there you are seriously missing out on one of the best parts of living in Charlotte. 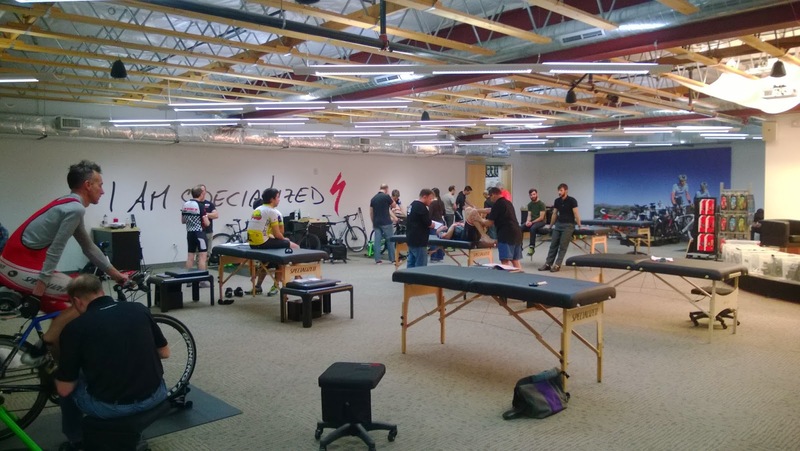 2) Pack and fly out to San Jose, California to attend Specialized Body Geometry Fit Level 1 Course. 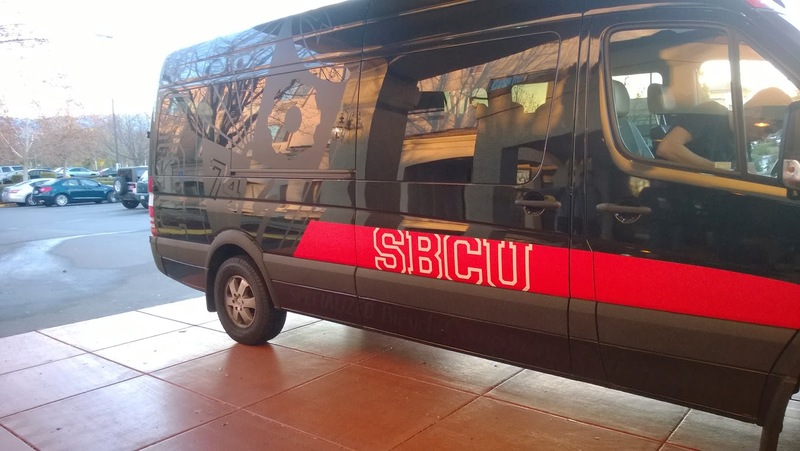 Specialized has a program that it calls "SBCU," which stands for Specialized Bicycles & Components University. This set of classes is designed to impart on their retail sales professionals, technicians and fitters and increased knowledge base and skills with which they are better suited to both help customers and sell to customers. There are retail sales management classes, suspension service classes, marketing and display classes and most importantly, 3 levels of fit "classes." Since Inside Out Sports sells Specialized aero products, it makes sense that someone in the Charlotte store should attend the BG Fit course. BG (Body Geometry) represents Specialized's brand philosophy when it comes to apparel, fit, and equipment. Originally developed by Andy Pruitt, BG Fit is a science based, multi step process that puts the rider in the optimal position for their body on the bike. 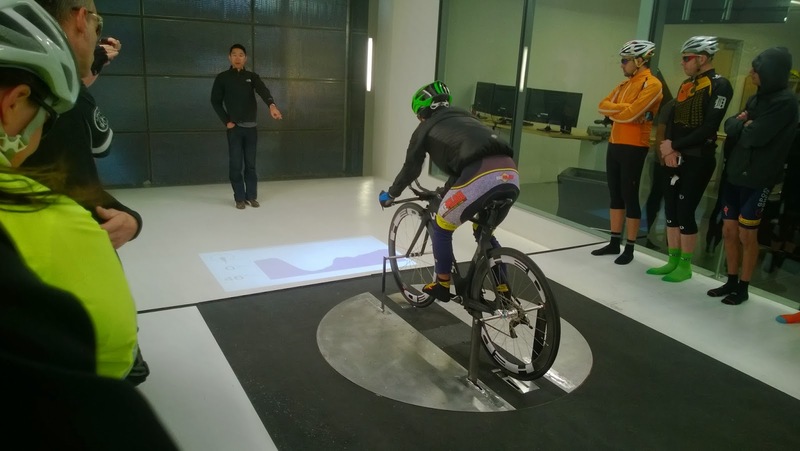 Fit Level 1 deals entirely with road bike fit and the pre-fit assessment of the rider. 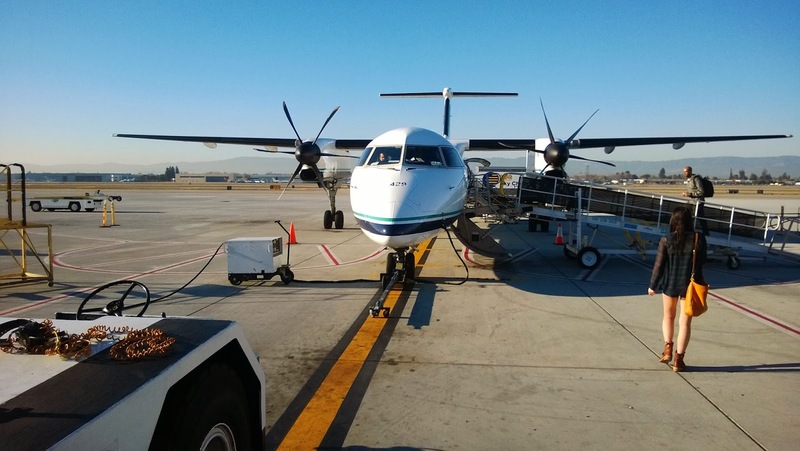 This is the van that transported us to Specialized headquarters in Morgan Hill, CA every morning. The class consisted of ~25 retailer people like myself with varying levels of fitting experience. I was the only triathlete-focused rider in attendance so a lot of my preconceived notions were luckily related to aero-fit and not road fit. 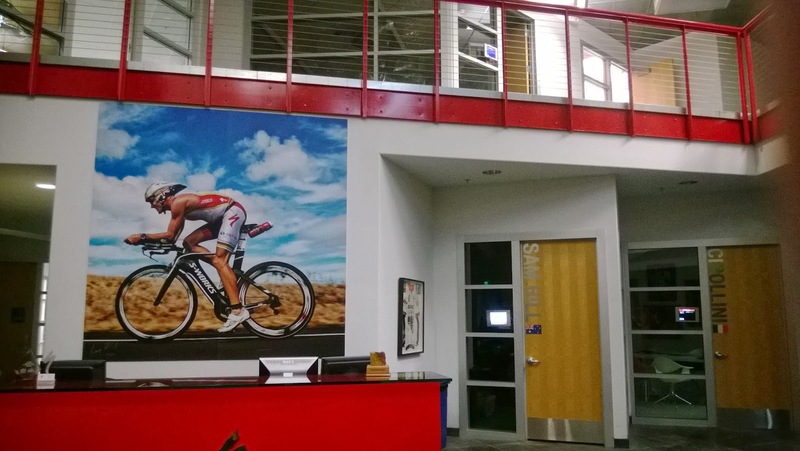 Hard not to be intimidated by a public entrance that features Crowie, Cipollini and Sam Hill. The headquarters just give off this vibe of awesomeness. It's really hard to put into words. 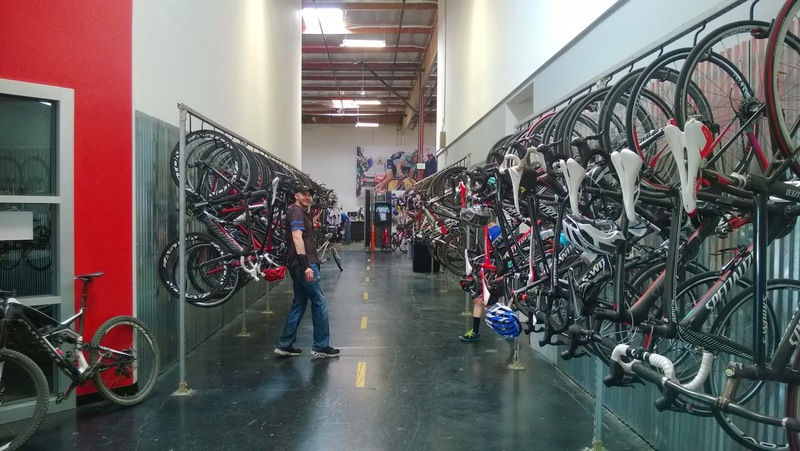 You can tell Specialized is a HUGE company and everybody that works there LOVES bikes. If you didn't like bikes, you wouldn't want to work there. Admittedly, 8 weeks ago the atmosphere surrounding Specialized and its vibe was a little more tense, but I wouldn't put the "blame" of that on the people that work there (except, maybe, for the slightly overzealous legal department). Specialized is a brand that obviously wants to protect its identity and luckily, because of how big it is, gets to play that card. Anyway, the class itself consisted of teachings from 4 different people, each of whom has vast experience with BG fit. Day 1 was a lot of classroom instruction and a brief ride. Day 2 was a morning of instruction and an afternoon of lab work (fitting, further lab-specific instruction, etc) and a brief ride. Day 3 was all lab work (fitting, specific assessment instruction, video demonstrations, etc). One of the main highlights was getting to pick whatever bike you wanted from a huge stable for the group rides and the fit sessions. 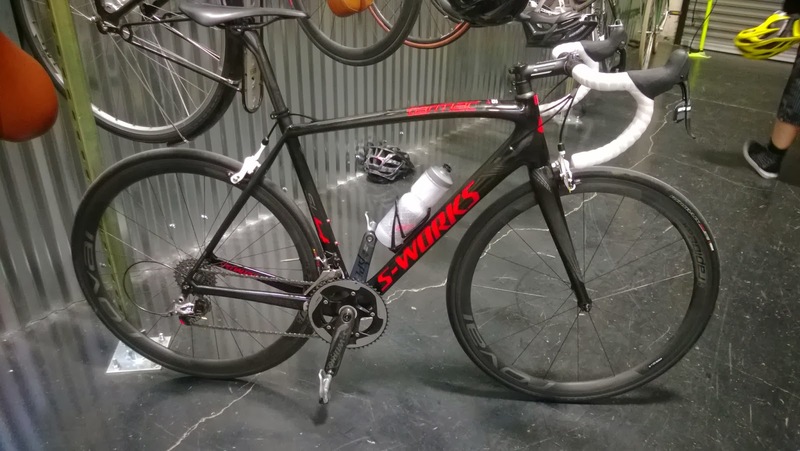 On day 1 I rode a Venge Pro and on days 2 and 3 I chose an S-Works Tarmac SL4. On day 2 we also got to tour the ~year-old Specialized Wind Tunnel (more casually referred to as the "Win Tunnel" and the "Breezy Hallway"). Considering I've had a fair amount of experience at a wind tunnel myself (3 visits anyway) and was the only person among the group that had tunnel experience I felt "special" in a way. The tunnel itself is very cool. Interestingly, a lot of their modeling was done based off A2's construction (Specialized was one of the biggest clients of A2 prior to their own tunnel construction). .
At the end of 3 days of instruction and lab work, we all emerge as certified BG Level 1 fitters. What does that mean? Well, at the outset it does not mean much. Many fits down the road there will be a perfected (or at least more fully developed) practice and a bigger base of experience for each of us. At that point, maybe you tackle level 2 (although I would guess that the transition to level 2 does not happen for most Specialized dealers) and aero-fitting? Who is to say what the future holds. I am very happy to have had this instruction because it means I'm basing what I am doing off more than just intuition and my own experience. I'm basing it off scientifically proven methodologies that have sound grounding and a huge "case load." All in all, it's been a good, if off, 6+ weeks. I am excited to get back to working out on a regular schedule again. I am excited to start crushing dreams again. Even if they are my own, the time has come to get back to being a real athlete. My 2014 schedule is not really set in stone yet because I don't really know what I want to do this year in terms of racing, but hopefully that will flesh out a bit in the next month.